Since its inception, Vacform Pty Ltd. has designed and manufactured an enormous range of custom plastic components for industry. 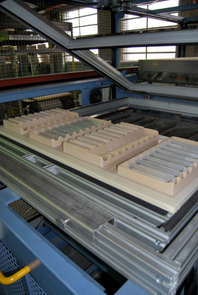 Vacuum forming is a relatively inexpensive process compared with other plastic moulding processes. Tooling is inexpensive and quick to turn around making it suitable for short production runs, typical of Australian projects. A wide range of thermoplastics are available to suit your specific needs. Plastics that offer flame retardancy, high impact resistance, UV stabilisers, anti static or glass like clarity are easily moulded by the vacforming process.Typical components moulded by our process are external fan housings, case inserts, cash drawer inserts, bus seat covers, automotive components, electrical components and tote boxes and inserts. Vacform runs a 3.5 axis CNC router plant to facilitate fast turnaround for our display business. We have extra capacity to take on contract cutting of MDF and plastic. We cut flat sheets up to 1800mm x 3600 mm or jig up for trimming of 3d plastic mouldings – allowing holes and 3D trim paths. We also offer edging facilities for prefinished laminate board. CNC routing offers fast, accurate and cost effective results. Our design department is here to help with design for flatpacking. Vacform runs a 3.5 axis CNC router capable of cutting timber, plastic or composite sheets up to 1800mm x3600mm.We also use it for 3D trimming of plastic mouldings. Crystal clear moulding comes off highly polished production die. Chair backs are moulded in stipple finish ABS for a local chair manufacturer.